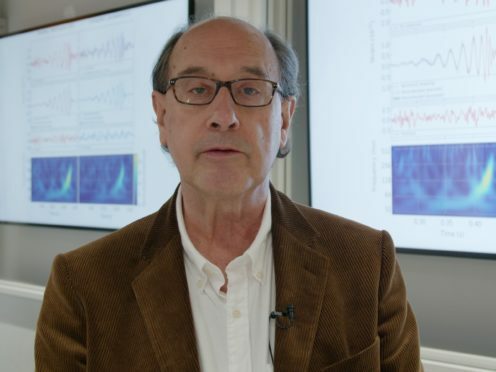 Professor Bernard Schutz, 72, will receive the prestigious Eddington Medal from the Royal Astronomical Society for “an investigation of outstanding merit in theoretical astrophysics”. The American physicist, from Cardiff University’s School of Physics and Astronomy, joins celebrated astrophysicists including professors Stephen Hawking and Sir Roger Penrose in being awarded the accolade. Prof Schutz explained in his 1986 paper how gravitational waves could be used to measure the cosmic expansion rate. He argued the waves from mergers of two neutron stars or black holes were “standard sirens” which carried information about their distance to Earth. His theory was realised 30 years later in 2017 when both gravitational and electromagnetic waves were detected by the Laser Interferometer Gravitational Wave Observatory, whose creators won a Nobel Prize. Prof Schutz will receive the award, named after English astronomer Sir Arthur Eddington, who made the first empirical test of Einstein’s theory, at the National Astronomy Meeting at Lancaster University in July. He said: “The medal is more than a recognition of work done 30 years ago. “The pleasure of achieving this recognition is a reward for having dedicated much of my career to reaching the goal of opening the field of gravitational wave astronomy. He added: “The observations we have made so far are just the beginning.